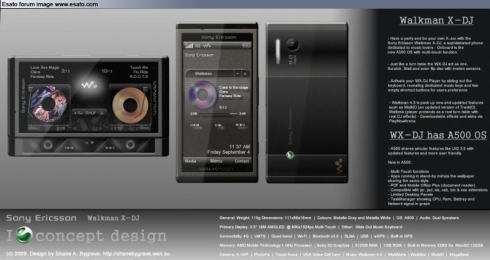 It’s been a while since we last saw a Sony Ericsson Walkman phone get launched, but at least we’ve got concepts, like the one that Shane A. Bygrave from the Esato board created. Dubbed the Sony Ericsson Walkman X-DJ, this music phone comes with dual speakers, a 3.5 inch AMOLED multi-touch display and a slide out music keyboard. Walkman X-DJ supports 4G connectivity, UTMS, quad band, Wi-Fi, Bluetooth 3.0, DLNA, aGPS and it packs a 1 GHz processor (AMD Mobile Technology), Sony 3D graphics, 1GB ROM, 32GB internal memory and a microSD card slot (120GB of extra memory). There’s also an 8 megapixel camera at the back and a funny feature, that’s either generated by my poor sight or a slip of the designer: 512GB of RAM. Now THAT would be something!